Regardless of the quality of your drive, the Cadillac Escalade golf cart will make you look great. American Custom Golf Cars (ACG) and Cadillac teamed up to design and engineer this vehicle that is so much more than a golf cart. Because they’re licensed by Cadillac and made exclusively by ACG, every Escalade golf cart is guaranteed to be functional, gorgeous, luxurious, and high-quality. Cadillac golf carts surpass the standard definition of a golf cart. Many people refer to them as “golf cars,” an unofficial term that suggests that a golf car is more car than a cart. These are luxury electric vehicles for the golf course and your life. If Not Just a Golf Cart, What Is It? Golf carts by ACG and Cadillac technically exceed the definition of a golf cart and are classified as low-speed vehicles (LSVs) or neighborhood electric vehicles (NEVs). Have a maximum weight of 1300 lbs. Standard golf carts don’t require these items. The Escalade golf car offers the best of both worlds. It’s community LSV, and it’s a golf cart. Use it on the streets of your neighborhood and the paths along the fairways. Golf in luxury. Zip around in class as you do errands in your community. Go for a quiet, easy drive. Whatever you wish to do, when you take this LSV that resembles the real Cadillac SUV, you’ll have fun and do it in luxurious style. 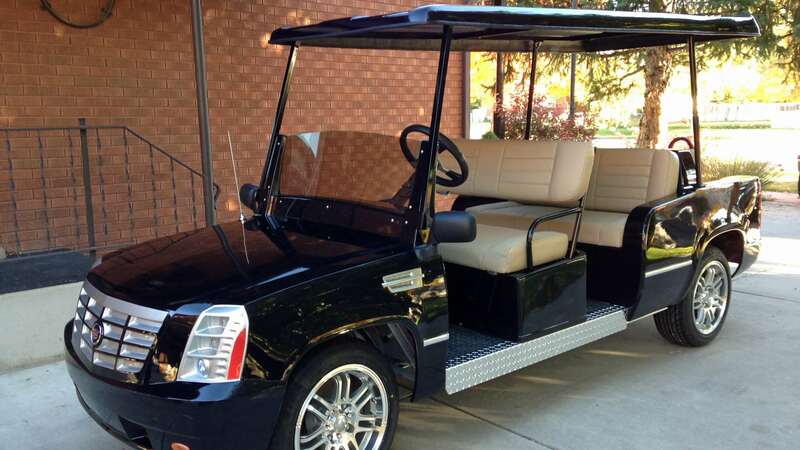 The mini Cadillac Escalade golf cart fits right into both golf courses and neighborhood communities. Having a Cadillac Escalade LSV can be efficient. It can also be quite fun. Cadillac has a reputation for comfort, luxury, class, and quality. The golf car is no exception. Cadillac engineers were involved in the design of this LSV to ensure that it not only looks like an Escalade but feels and functions like one, too. This electric vehicle is manufactured with all new parts; no corners are cut by using refurbished components. The Cadillac golf cart body is one-piece fiberglass composite, and the frame is sturdy and durable thanks to aluminum I-beam construction. Also, courtesy of the aluminum, the frame won’t corrode. Extravagance abounds. The interior boasts accents of simulated Burlwood. As people watch you approach, they’ll see a grill that is perfectly color-matched to your cart. The 16-inch wheels are chrome and add a crisp touch to the look of the vehicle. Standard colors are black, white, gray, and red. If you prefer a different color or even graphics, many custom options are available. Speak with an LSV dealer locally or online to discuss choices and pricing as well as features in the Cadillac golf cart body kit. This elite LSV cart even lets you charge your phone or laptop while you golf or run errands through your neighborhood. A 12-volt converter provides the necessary power source. With just one glance at the Cadillac golf cart, you can see its elegance. Beyond the surface lie the elements that make it run so powerfully and smoothly. Just as a Cadillac Escalade SUV has impressive specs, so too does the golf cart version. This brief run-down of what drives the Cadillac LSV will provide a general sense of its power and capabilities. The AC motor boasts 17.5 peak horsepower. The high output makes it fast and efficient; indeed, the top speed of this golf- and neighborhood car is 25 mph. While the battery performs well as-is, enhancement options are available. Equip your golf cart with an extended range battery system. You can also add a single point battery filling system to quickly, effortlessly, and safely refill the water in your battery. Whether you’re on the golf course or buzzing around your community, your brakes will do their job well. The Cadillac Escalade golf car’s four-wheel braking system is a standard feature of every Cadillac cart. It utilizes both front and rear wheels in the breaking mechanism. Front brakes are hydraulic disk brakes, while rear brakes are seven-inch mechanized drum brakes. Superior braking means increased safety and performance. From a speed of 12 mph, the Escalade has an eight-foot braking distance. Everything discussed to this point has been standard features in the Cadillac of golf carts. While it might not seem possible to improve the quality and class of this LSV, there are options available to let you add precisely what would make the vehicle even better for you. You even have seating options. 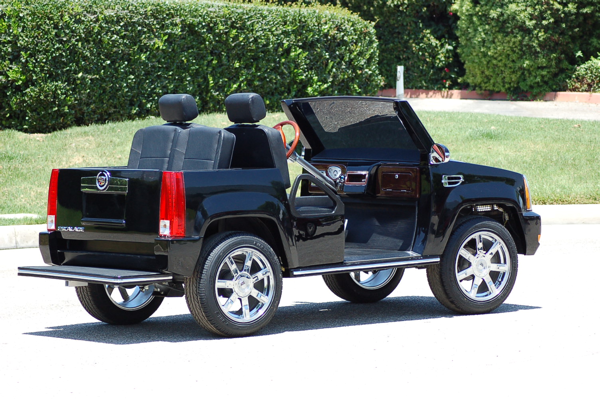 Regular Escalade golf car models come in two- or four-person seating styles. Choose one of those sizes, or opt for the Cadillac Escalade LSV limo, which seats up to six people. This street-legal, LSV, Cadillac golf cart is powerful, fast, and useful all around your community. It’s also just plain fun. Golfing is enjoyable, too (usually), so even though it might be easy to forget that this Cadillac is first and foremost a golf cart, it is designed for golf. One of the reasons it might be easy to forget that this electric vehicle is made for the golf course is that on first glance, there’s no evidence that this car is meant for golf. The golf bag attachment, which holds two golf bags and secures them to the back of the art, is removable. You can drive around your community without it and easily and quickly attach it when needed. Whether you’re an avid golfer who enjoys golfing in comfort and class or you are active in your community and enjoy doing errands and visiting friends in style, the Cadillac Escalade golf cart/LSV has much to offer. The quality, power, and safety of the Cadillac golf cart are superior. Spend less time maintaining your electric golf cart and more time enjoying it when you choose a Cadillac. When you’re using a Cadillac Escalade electric vehicle, you can be confident that you’ll have a beautiful drive both on- and off the golf course.